It's been a while since my last movie review hasn't it? That won't be the case anymore as I'll be doing way less wrestling reviews and focusing more on movies and games. 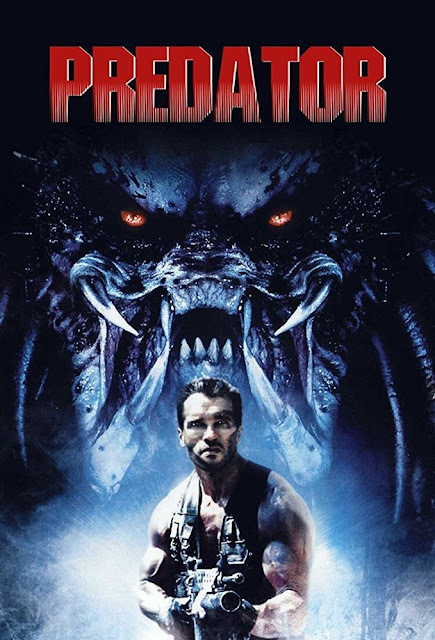 So I was planning on looking at other movies but then the new Predator movie kind of snuck up on me and releases in just over a week, so I thought I'd take a look at the original that started it all over 30 years ago. How does it hold up? Let's take a look. The movie follows Dutch (Arnold Schwarzenegger), the leader of a troop of badass commandos, well known for their fantastic tactical skill, as they have been brought in by Dillon (Carl Weathers) on a rescue mission to find survivors of a helicopter crash in a South American jungle. Unfortunately the survivors appear to have been butchered and some taken hostage by a group of rebels. Even more unfortunately, there appears to be something deadlier lurking in the forest that will become a bit of a problem. This movie was released a year after the fantastic Aliens and its set up has a similar feel in that we're introduced to this group of tough soldiers that seem untouchable, only for them to go up against impossible odds. The major difference being that this group actually gets a proper chance to show off their skills, specifically in a shootout in a village against some of the rebels. This part of the movie is terrifically fun with Arnie throwing around some of his awesomely cheesy one liners (Stick around!) and the rest of the team gets to shine, including legendary wrestling star Jesse Ventura. In this part he gets what is one of the coolest lines ever as one of the team notes that he's bleeding and he replies with "I ain't got time to bleed". How can you not love that? Plus he has a pretty sick minigun that is used quite a bit. What's also an interesting fact of the film is that one of the troops, Hawkins, is played by great director Shane Black, who is now directing the 2018 Predator film. I think we may be in good hands come release day. 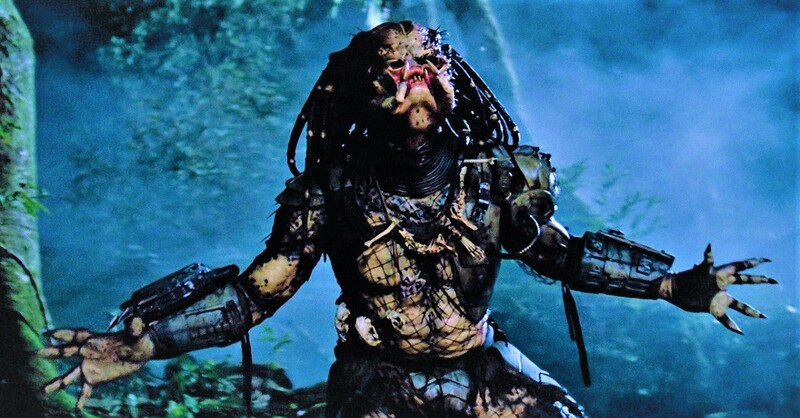 Although I think we all know who the biggest star of the movie is: The Predator. If the Alien is the perfect organism, then this thing is definitely the perfect hunter. I love this creature and it's one of my all time favourites. It just looks so unique and it's methods of killing are so fun to watch. Gory as well mind you, as it doesn't mind some dismemberment, and tends to skin victims once he's finished killing them in brutal fashion. It can also go invisible at will, meaning it always feels like it's there, watching and waiting to pounce on the next unfortunate soul that comes across it. Pretty scary. Sadly some of the special effects to bring the creature to life have dated quite a bit, especially when it's invisible as it almost makes me wish that they'd done some George Lucas magic and redone them. I will say though that the heat vision sections do look really cool and actually give some decent jumpscares at the same time as the moments in which it's used come out of nowhere. When it comes to Arnie vs The Predator it's some of the best action scenes you'll see as Arnie uses all his knowledge of how the creature operates to try and take it down once and for all, so he can end the killing and avenge the dead. The only real criticism I have is a side plot involving Dillon's real intentions for the troop but it's only really there to cause a bit of drama and is never really brought up again so it adds nothing to the main story and ends up being completely forgetful. Still though this movie is a stone cold classic. It's one of the best action movies you'll get to experience and I implore you to watch it if you haven't seen it before as it's one that can't be missed. Plus it has Arnie screaming "Get to the choppa!". Need I say more?